We make your health goals a reality. When you participate in NeoLife’S Be Your Best Challenge, you have the accountability, support and motivation to reach your fitness and weight loss goals. Plus, over the next 6 months, we’re awarding over $25,000 in prizes! Will you be the next winner? Enter the 30-Day Challenge today using the NeoLife Club App on Iphone. Be Your Best Challenge Flyer: See Challenge info and details on how to be your best and WIN. 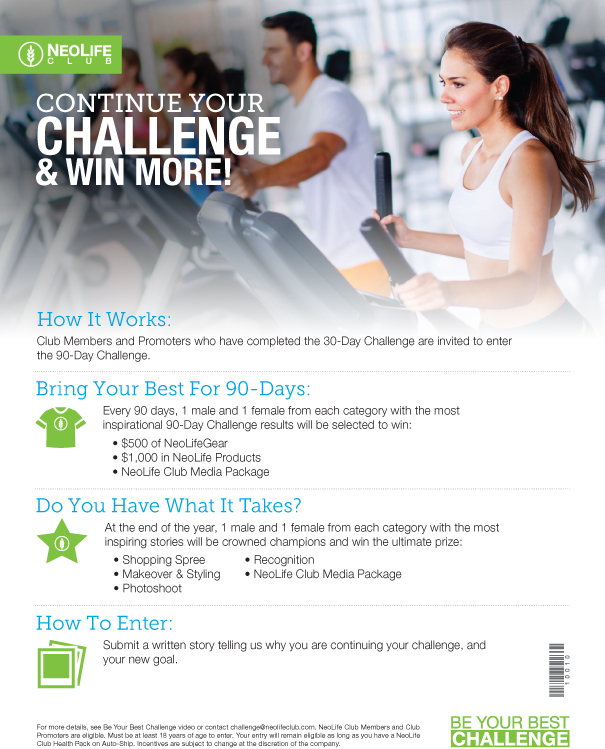 My Story Flyer: Fill this out and email to challenge@neolifeclub.com to enter the Challenge today. My Photo Flyer: See simple instructions on how to take your Challenge entry photos. Have any questions? Email challenge@neolifeclub.com.